Manage and file large volumes of unpatented mining claims in the United States using Landfolio software. 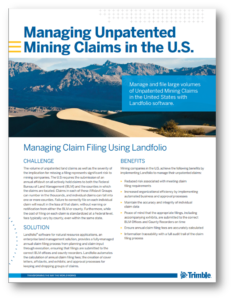 Landfolio provides a fully-managed annual claim filing process from planning and claim input through execution, ensuring that mining claim filings are submitted to the correct BLM offices and county recorders. The volume of unpatented mining claims and severity of the implication for missing a filing represents significant risk to mining companies. The United States requires the submission of an annual affidavit on all actively held claims, including unpatented mining claims, to both the Federal Bureau of Land Management (BLM) and the counties in which the claims are located. Claims in each of these Affidavit Groups can number in the thousands, and individual claims can fall into more than one county. Failure to correctly file on each individual claim will result in the loss of that claim — without warning or notification from either the BLM or county. Furthermore, while the cost of filing on each mining claim is standardized at a Federal level, fees typically vary by county, even within the same state. Landfolio® software for natural resources, an enterprise land management solution, provides a fully-managed annual mining claim filing process from planning and claim input through execution. This ensures that filings are submitted to the correct BLM offices and county recorders. Landfolio automates the calculation of annual claim filing fees; creation of cover letters, affidavits, and exhibits; and approval processes for keeping and dropping groups of claims. Facilitates the bulk loading and editing of claims and their associated spatial information. Configurable “Groups” allow for the establishment of relevant affidavit groups as containers for the lists of claims that are filed together. Parameter value functionality combined with the sophisticated business rule engine uses a combination of Map References and associated Parameter values to calculate total fees, on a per Affidavit Group basis, that need to be filed with the BLM and each individual County. Map Reference functionality tags claims to the counties that they fall within, and the affidavit groups inherit these map references from the related claims. Map references and parameter values are used to select the correct BLM and county addresses for the annual filings. Custom Reports are used to create client specific exhibits that conform to county filing rules. The Approval function can be used for the retention or disposal of large numbers of claims in bulk. The selection of individual claims and their associated actions and approvals can all be done from the configurable map interface. Alerts (Notifications or Reports) for the annual claim filing process are sent out at configurable time intervals.